In travel, I’ve found that some days are fun, some days are meaningful, and some days are both. Occasionally, you have a day that is neither. The day we visited Auschwitz-Birkenau falls solidly under the “meaningful” category. I cannot say a single moment of the visit was fun, but it was intensely powerful. For simplicity’s sake, we signed up for a tour group in Kraków. 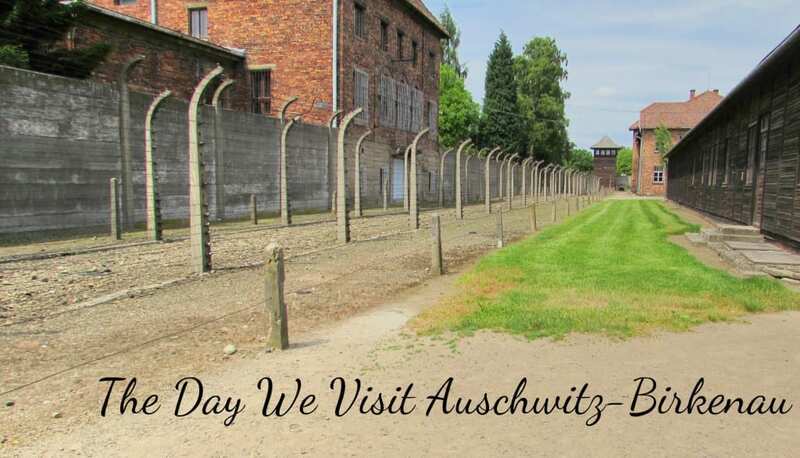 You can take trains and buses to visit Auschwitz-Birkenau by yourself (check out this guide to getting to Auschwitz-Birkenau from Krakow, or this full guide to visiting Auschwitz-Birkenau), but their schedules and drop off points vary. We didn’t want to be remotely worried about transportation, timing, finding our way either to or between the camps, or arranging an organized tour (which we did take part in and I highly recommend). We ended up paying $55 USD for the two of us, including the organized tour, and transportation to, from, and in between the two camps. The camps are 3 km apart, or about 1.86 miles for us US folk–walking distance for some, but unless you just despise rest, you’re going to be physically, mentally and emotionally exhausted at the halfway point of the tour, and not inclined to walk. I’m sure budget travelers can find cheaper ways to visit (entrance to the museum is free without a tour, though we found the tour invaluable), but for our moderate budget, the structure worked out well. Our tour lasted about 3.5 hours. You can also take extended, all-day, 6 hour tours. According to our guide, those tours delve further into the barracks of Birkenau (we toured 1 barrack and one lavatory), show more gas chamber ruins (we saw two destroyed and one standing: more than enough), and also go out to “Canada”. Of all of those, I would have been most interested in seeing Canada, which was the prisoner’s name for the area where all the stolen luggage and goods that the families brought with them to “resettle” was held. Why was it called Canada? Because the prisoners knew of Canada as a rich country. The museum and the guides were full of a million little details like this–things that are either overlooked by or forgotten during a general history class, that are really only seen when delving deeper into a subject. 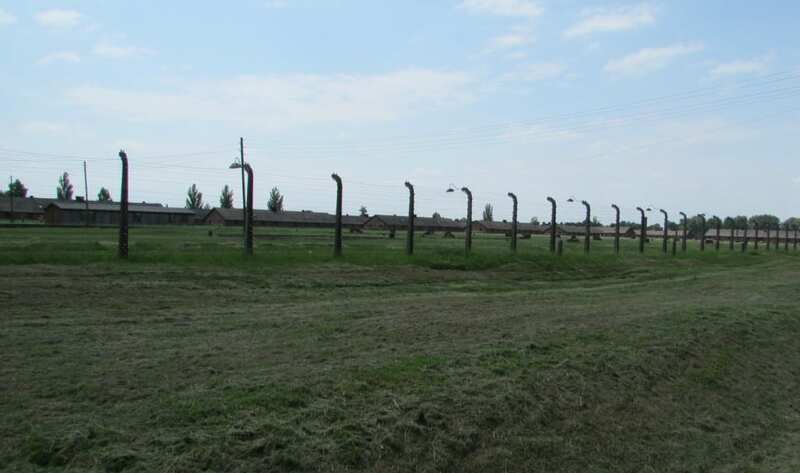 The first part of our tour went through Auschwitz I, which was the smaller, more administration-driven camp. It was also the original camp, and the sister work camp, Birkenau, was built as the Nazis gained more power and brought more people to the site. 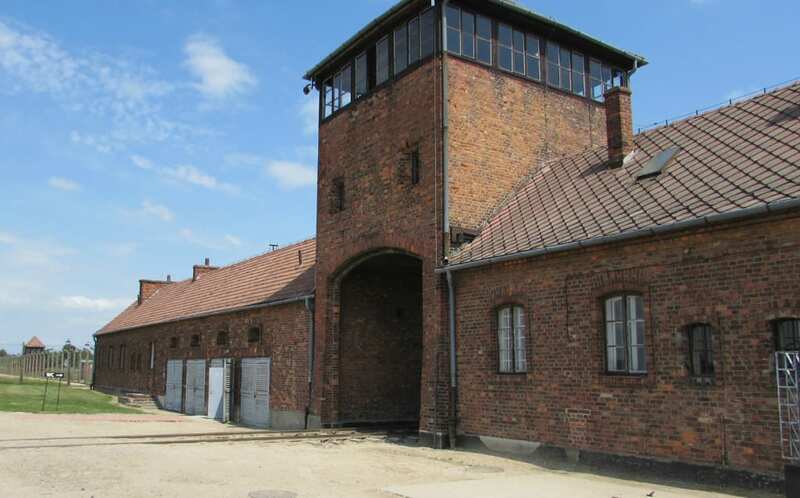 Auschwitz I is home to many infamous sights, including the Black Wall and entrance gate. The entrance gate we see today is a replica, put in place after the original was stolen (and later recovered, to be stored safely away). The Black Wall, with memorials left by recent visitors. This area of camp also holds many diagrams and museum materials, showing the heavy impact the Nazis had. Most disturbingly, it has the things: stolen goods from the victims and prisoners–piles of shoes stacked above our heads that go on longer than a football field, suitcases with names and addresses painstakingly written on them (as was the custom of the day). Enough dishes to furnish every kitchen in Poland. Baby clothes. Canes, crutches, false limbs. 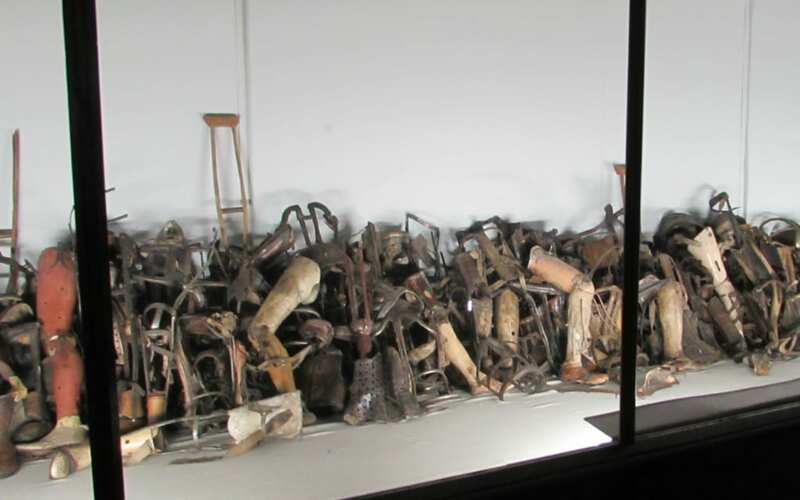 Prosthetics, canes and crutches stolen from their owners. And finally–in a room that cannot be photographed–hair. So much hair, shaved off the heads of victims and prisoners as they arrived: beautiful braided hair, messy short hair, long hair, dark hair, light hair, curled and straight–gobs and gobs of it, too much to describe. Jeremy is a pretty stoic guy, but not here. I have never seen my husband moved closer to tears in public than he was in this place. As for myself, I can count the number of times I’ve cried in public on one hand–but this series of rooms is definitely on that list. From here, the tour takes you through the “punishment” area–torture chambers, really, where people were starved and sleep deprived and all manner of other awful things, as if simply existing in the horror wasn’t torture enough. The Auschwitz I tour concludes with two areas that stuck out to me: first, a gallow, where the mastermind of Auschwitz was hung shortly after the war. What disturbed me most about this was not the gallow–how could anyone see anything but righteous justice in that death?–but the story our guide told, which I will never forget. The Gallows. Out of sight is the man’s house, which is just a few hundred feet to the right, steps outside of Auschwitz I. Apparently, a few months before our visit, a family of Neo-Nazis came to lay flowers at the gallows in honor of this man. They came to pay tribute to him, and stayed for a private tour. 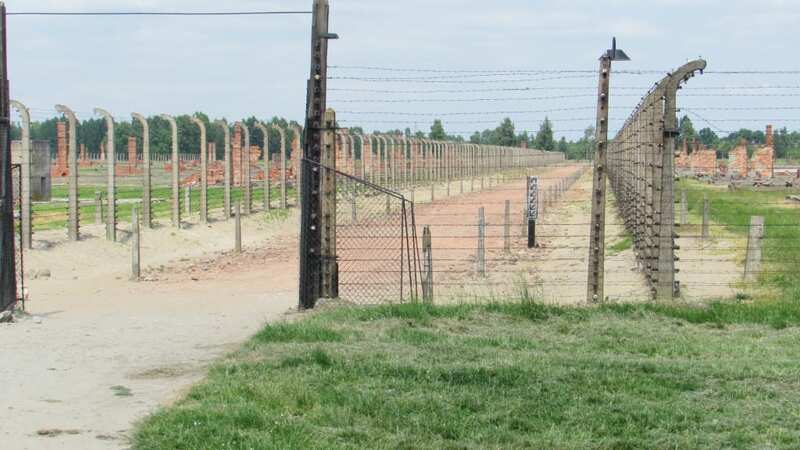 How the guide who handled that tour kept their composure, I have no idea–I wanted to throw up just hearing about it, and it’s very clear that for most of the guides at Auschwitz-Birkenau, their presence there is less of a job and more of a calling. I’m sure this family was not the first and will not be the last, but that does not make me any less disgusted by them. From here, we visit the last standing gas chamber, the one that the Nazi’s were unable to blow up before liberation. This image is also seared in my mind–it is impossible not to be moved by such a place. At this point, the halfway point, we took a much needed break before riding over for part two: Birkenau. The break was long enough to grab a short meal, but there’s not much selection nearby–a small gift shop and one food stand. I would recommend bringing something if you take a tour, but you’ll need to store it on the bus: no bags larger than a very small woman’s purse were allowed into the museum. Birkenau holds the famous train station, the majority of the barracks, and almost all the (remains of) the gas chambers. There is a different atmosphere here than Auschwitz I: Auschwitz I is packed in, close together: you can feel it closing in on you. Birkenau overwhelms you in the opposite way: the sheer expanse of it chokes you–all you can see, from all sides, are the ghosts of horror. We toured the famous barracks–the one we were in had murals drawn on the walls from trying to entertain the small children who were kept there. We saw Jewish Way, where most of the Jews who arrived were herded toward the gas chambers in the tree line. We saw the crumbled remains of two gas chambers–having seen a horrific diagram of them earlier, it was disturbingly easy to pick out the layout of the different rooms and their purposes. 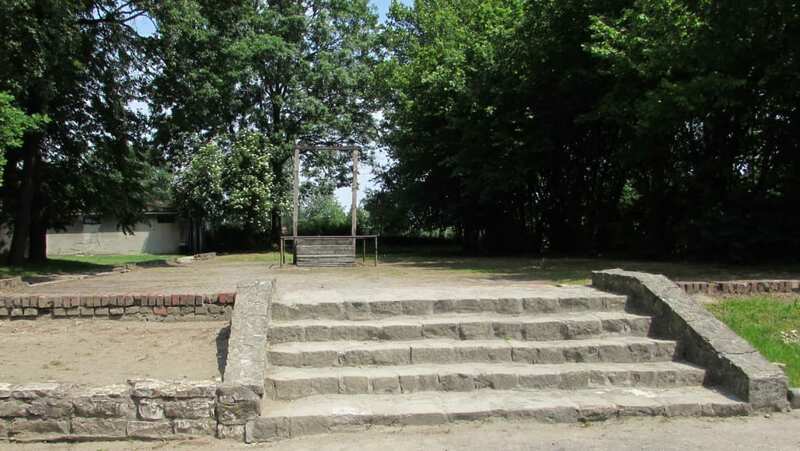 Jewish Way: The spot where the many victims of Birkenau were separated from the prisoners before being taken to the gas chambers in the tree line. Here, also, lays the memorial. I photographed the English one, but there are 32 identical plaques like this, in all different languages: one for the native language of each prisoner and victim. When we were there, they had just recently added the 32nd–Slovakian, I believe, based on some new research that had been done. We learned so much during our chance to visit Auschwitz-Birkenau–the museum is very well put together, very informative, and of course, very heart-wrenching. 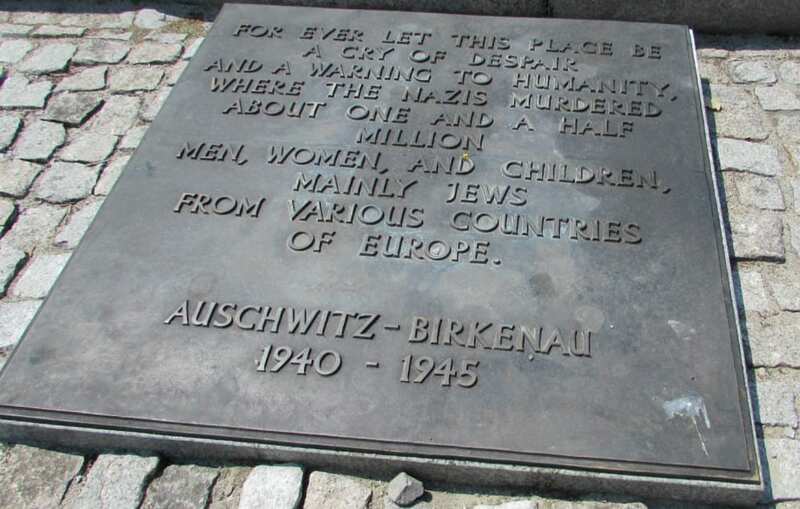 Though we learned about the Holocaust during school, in both history and English/literature classes, there is simply nothing like standing on the ground where more than 1 million people were brutalized, tortured and exterminated because of bitter racism grown far out of control. Our tour group was very quiet on the bus back to Kraków: the driver showed a film of the liberation of Auschwitz-Birkenau and the lifelong impact the experience had on survivors, and most of us watched. Before and after that, though–silence. Many people stared out the bus windows at the gorgeous Polish countryside, as we had on the way in–but you could tell, no one was really seeing the landscape this time.